DH: We wanted to provide background regarding what information has become available recently through vital statistics data on the cause of fetal death. The National Vital Statistics System is an example of intergovernmental sharing of public health data, and in the United States, State laws require the reporting of fetal deaths, and Federal law mandates national collection and publication of the data. There is much we can learn from the statistics in this study. Q: Why focus on fetal deaths of 20 weeks gestation or more in your report – versus fetal deaths of any and all gestation? DH: Because the States typically require reporting of these events, we focused on fetal deaths of 20 weeks gestation or more. These spontaneous intrauterine deaths are sometimes referred to as stillbirths. While there are a few states that report fetal deaths at all gestation periods, consistent national data is found at 20 weeks or more. Q: What are the most common selected causes of fetal death? DH: There are five most common selected causes of fetal death, one of which is listed as an unspecified cause. Placenta, cord, and membrane complications is another one. There are also congenital malformations, maternal complications, and maternal conditions unrelated to pregnancy. Q: What variations by maternal demographics, if any, did you observe in the fetal death data you examined? DH: The same five causes of fetal death were among the most common selected causes for many maternal characteristics. The characteristics of delivery weight and gestation period were different, and for these two, diabetes mellitus emerged, and maternal complications dropped below the top five selected causes for fetuses with longer gestation and heavier delivery weights. DH: Probably that the variations observed across maternal and fetal characteristics are consistent with those documented in other research. This represents an important expansion of what is available from vital statistics on fetal death. EJ: In this data brief, we are capturing for the first time four elements for measuring the electronic sharing of health information. 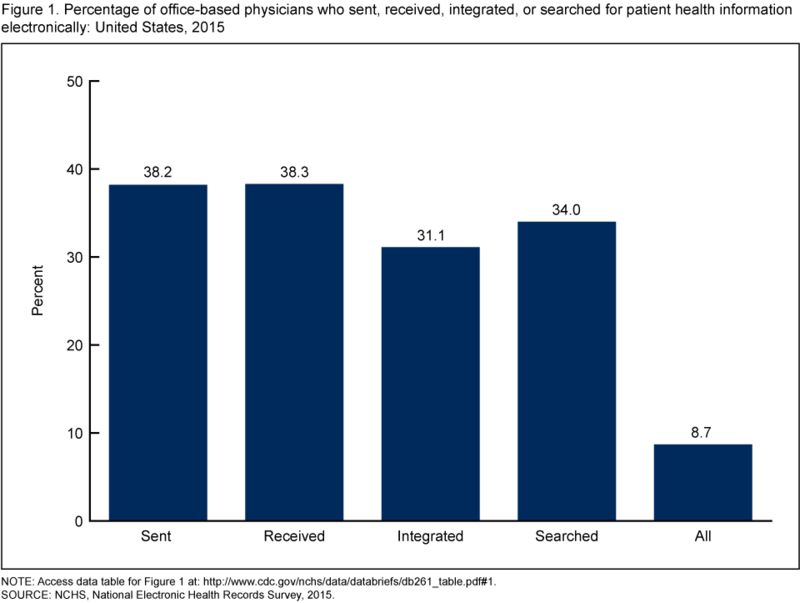 Specifically, we now have insight into the number of office-based physicians that electronically sent, received, integrated and searched for patient health information from other providers. Coupled with the recent release of a September 2, 2016 MMWR Quickstat that provided estimates on the number of physicians having electronic access to patient health information at the point of care, information is now available about the state of electronic information sharing by office-based physicians in the United States. Q: How many office-based physicians electronically sent, received, integrated or searched for patient health information from other providers in 2015? EJ: In 2015, roughly one-third of physicians indicated they either electronically sent, received, integrated, or searched patient health information in 2015. Specifically, 38.2% of physicians had electronically sent patient health information to other providers, 38.3% of physicians had electronically received patient health information from other providers, 31.1% of physicians had electronically integrated patient health information from other providers, and 34.0% of physicians had electronically searched for patient health information from other providers. Q: Which states did you find that electronically sent patient health information to other providers that were higher and lower than the national average? EJ: In 2015, the percentage of physicians that sent patient health information to other providers ranged from 19.4% in Idaho to 56.3% in Arizona. Arizona was significantly greater than the national percentage, while three states – Idaho, New Jersey, and Connecticut – were significantly less than the national percentage. Q: Can you explain what you found from state variation among physicians who had electronically searched for information from other providers? EJ: In 2015, 34% of physicians had electronically searched for patient health information from other providers, ranging from 15.1% in the District of Columbia to 61.2% in Oregon. Five states, which include Texas, Oklahoma, Missouri, Mississippi, and Pennsylvania, as well as the District of Columbia were significantly less than the national percentage. Whereas, 10 states were significantly greater than the national percentage: Alaska, Oregon, Washington, Colorado, Wisconsin, Ohio, North Carolina, Virginia, Maryland, and Delaware. Q: Do you have trend data that goes further back than 2015 on this topic? EJ: These data represent new information previously not available before on electronic information sharing of patient health information. Therefore, the information contained in this report represents a baseline for which future data can be used for trend data on these four elements of electronic information sharing among office-based physicians. Q: Why did you decide to study state variation in electronic sharing of information in physician offices? EJ: The Health Information Technology for Economic and Clinical Health Act provided financial incentives to eligible providers to demonstrate the meaningful use of a certified electronic health record (EHR) system, which also includes capacity to share patient health information. In 2015, a federal plan was published to enhance the nation’s health IT infrastructure to support sending, receiving, integrating, and searching for patient health information electronically. The 2015 data from the National Electronic Health Records Survey provides national and state based estimates about physician EHR adoption and use. The Health Information Technology for Economic and Clinical Health Act (HITECH) provides financial incentives to eligible providers using a certified electronic health record (EHR) system. In 2015, 77.9% of office-based physicians had a certified EHR system, up from 74.1% in 2014. A federal plan to enhance the nation’s health information technology infrastructure was published in 2015 to support information sharing. A new NCHS report uses the 2015 National Electronic Health Records Survey to describe the extent to which physicians can electronically send, receive, integrate, and search for patient health information. In 2015, the percentage of physicians who had electronically sent patient health information ranged from 19.4% in Idaho to 56.3% in Arizona. and Mississippi to 65.5% in Wisconsin. In 2015, the percentage of physicians who had electronically integrated patient health information from other providers ranged from 18.4% in Alaska to 49.3% in Delaware. District of Columbia to 61.2% in Oregon. Gestational weight gain was within the recommended range for 32% of women giving birth to full-term, singleton infants in 2015, with 48% gaining more weight and 21% less weight than recommended. Approximately 44% of women who were underweight before pregnancy gained within the recommendations, compared with 39% of women who were normal weight, 26% of women who were overweight, and 24% of women with obesity before pregnancy. Weight gain above the recommendations was highest among women who were overweight (61%) or had obesity (55%) before pregnancy. You are currently browsing the NCHStats blog archives for October, 2016.